Although the idea of a separate curriculum in Pulp and Paper Manufacture was proposed to the faculty by Professor Nelson C. Brown in 1914 and approved by College trustees in 1915, a curriculum was not developed until 1920. In that year, Clarence E. Libby and Harry E. Weston joined the staff of the Department of Forest Chemistry and were charged with the responsibility of developing a curriculum in pulp and paper technology. Louis Wise was chairman of the Department of Forest Chemistry, and pulp and paper manufacturing became a part of that department after Dr. Wise's retirement. The Department of Forest Chemistry became the Department of Pulp and Paper Chemistry, and Professor Libby served as chairman. Forest Chemistry was reinstated in 1952. No matter what its formal name, the Pulp and Paper program at ESF has flourished in its years, producing over hundreds of graduates, most of whom entered careers in the paper or allied industries. Now called Paper and Bioprocess Engineering (PBE), the program has evolved to include a Science Option, an Engineering Option and a Management Minor. The basic emphasis, however, has always been on basic sciences and engineering, with practical experience in the industry being a major component of the program. Throughout its history the program has been an innovative leader in pulp and paper education and research. 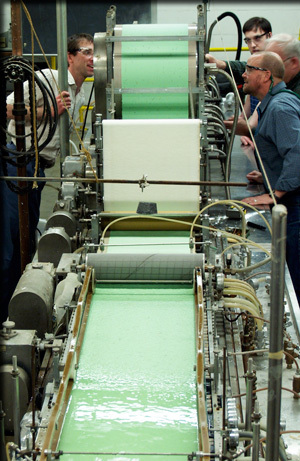 In 1938, ESF opened the first pulp and paper pilot plant connected with a university. The present PBE building, Walters Hall, was built around that pilot plant and the original machinery is still in place. Today Waiters Hall contains two Fourdrinier paper machines, one 48 inch and one 12 inch machine. The building also houses an environmental engineering laboratory designed for studies of various methods of paper recycling and waste treatment, a paper testing laboratory, and a large number of special purpose laboratories. In 1945, the Empire State Paper Research Associates (ESPRA) was established to provide financial support for research by the College on the use of hardwood for papermaking. In 1958, the College officially formed the Empire State Paper Research Institute (ESPRI) to recognize their joint effort with ESPRA in meeting research needs of the pulp and paper industry worldwide. Today ESPRA membership includes some 45 companies from 11 countries, and nine professors and 10 technical staff spend considerable time working within ESPRI. It was at ESF that the chemigroundwood process for producing paper from hardwoods was developed and where pioneering research in deinking newsprint was performed. U.S. and Canadian patents were granted for the chemigroundwood process to Professors Libby and O'Neil in 1955. The research in deinking newsprint was another collaboration with industry as Richard Scudder, a New Jersey publisher, established Garden State Paper Company, a producer of recycled newsprint. Other research projects that led to patents include "Method for Reducing Reversion in Lignin Containing Pulps and Articles of Manufacture Thereof" (Francis, Dence and Alexander; 1992), "Method and Apparatus for Determining Distribution of Mass Density" (Luner and Tomimasu; 1990), and "Process and Equipment Using Abrasive Plates in Disc Refining" (Marton and Brown; 1983). The two latter research activities also led to licensing agreements with industry. Graduates and faculty from ESF have gone on to join or establish other pulp and paper programs around the country. Irving Isenberg, ESF valedictorian of 1931, taught Fiber Identification at the Institute of Paper Chemistry for many years. Robert Hitchings '43, who taught at ESF from 1946 to 1954 went on to North Carolina State University. Michael Kocurek '64 established the Pulp and Paper program at the University of Wisconsin Stevens Point, and R. Chris Peterson, valedictorian of 1960, was chair of the CPBE faculty at Miami University in Ohio.Most graduates of the program have entered careers in the pulp, paper and allied industries and most stay in those careers until retirement. ESF grads have contributed mightily to the technical growth of the industry and they have filled the ranks of management. Today, ESF grads are working in virtually every major company in the pulp, paper and allied industries throughout the U.S. It is by their numbers and accomplishments that the success of the Pulp and Paper program can be judged a resounding success.